For the Galaxy S6 and S6 edge, Samsung brought forth UFS 2.0. Think of UFS 2.0 as the next big thing for mobile devices after the ubiquitous eMMC standard found in all devices operating with NAND flash memory. UFS has up to four times faster data transfer speeds. For example, eMMC 5.1 - the standard's latest version - achieves transfer speeds of up to 250MB/s (read) and 125MB/s (write). The older eMMC 5.0 standard is no slouch either, and is found in most top-end handsets powered by Snapdragon 801 chipsets and above. That's impressive enough, but UFS 2.0 HS-G2 goes up to 725MB/s, and HS-G3 has a peak speed of 1.45GB/s. Woah! Additionally, unlike eMMC, UFS allows for simultaneous read/write processes, and prioritizes incoming commands as to execute them as quickly as possible. Speed improvement aside, this gives it an additional edge over good old eMMC. And while UFS 2.0 is more energy-consuming compared to the frugal eMMC, it makes up for this by getting stuff done and going to sleep quicker! Outta boy. 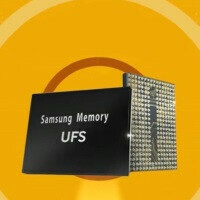 The introduction of UFS 2.0 memory to Samsung's high-end mobile devices - at the time, we could only speculate it was the Galaxy S6 and Galaxy S6 edge - certainly piqued our interest. There was no way those speed improvements we spoke of above wouldn't impact their performance across all usage scenarios - especially when it comes down to app and file load times! Thankfully, at MWC 2015, we managed to put a pre-release Galaxy S6 edge unit through the AndroBench memory speed benchmark test to hunt down any measurable improvements. It's certainly the right tool for the job, seeing that it's able to measure random and sequential read and write memory access speeds. What does that stand for as a performance metric? You've never seen anything like this in a smartphone! Now, the truth is that when it comes to flash memory, the concept of random and sequential reads/writes doesn't really apply, because it comes from the world of hard disk drives. But just so you get the general gist of it - in random read and write operations, blocks of data aren't written in neat, organized clusters, but randomly spread all over the disk space. This is usually the case with most user applications, and in hard disk drives, it results in a reduced data throughput. That's because it involves lots of spinning of physical plates and a hard drive head rushing to get to the correct chunks of data in time, introducing latency - the original performance killer. Sequential read and write speeds are important in regards to accessing and storing large files (such as high-resolution multimedia content). Single large files tend to be stored in uniform clusters of data on a singular region of disk space, in easy to follow sequences. Thus, even though flash memory doesn't really care how data is arranged, good sequential read and write speeds means nice performance in file operations. And with those hi-res video files and losless music taking up sizeable chunks of our mobile devices' disk space, it goes without saying that sequential read and write speeds matter. With all that into account, let's see how Samsung's flagship smartphones compare with the best of last year's technology in terms of memory performance. Looking at the impressive results posted by the former, it seems Samsung wasn't joking at all when it rallied about the Galaxy S6 & S6 edge's memory speeds. You've never seen anything like this in a smartphone! Unfortunately, it will be a while before UFS 2.0 memory reaches to mid and low-end tier devices, because right now, it's rather expensive to produce and is, thus, going to be a feature of flagship products. No one even in this article mentioned anything about the Galaxy S6 is the first phone to use DDR4 ram. The vast majority of smart phones currently on the market are using DDR2 with only a handful using DDR3. The M9 has DDR4 ram also. So what are you talking about? The G Flex 2 also uses DDR4. The Samsung boys are all on fire, only Samsung has the latest and greatest, the rest is crap. I would agree if they would just stop trying to make Android their own. I like stock better. Well, my only experience is with the S4 and I'm not a fan. I will admit that it is by far the most attractive Android phone when discussing physical hardware. these benchmarks are pointless. every samsung phone tops every benchmark at launch but in few months, it starts to lag, does not receive updates, i mean s5 is getting lollipop now?!??!?!??!!!! also samsung changes their flagship every 6 months....S6 is not a good phone! Both. Some people will never let go of this lag s**t.
I guess he hasn't seen the S4 running 5.0 because even after almost two years that phone is on steroids. Bet you this "teenaxta" guy will still end up buying a S6 though.! Of course, just like everyone who bashed the S5 last year got one. Nothing new. S5 received Lollipop before the HTC M8 did, which was back in January. If you want to focus your hate to no updates, Sony has yet to release 5.0 to ANY of it's devices. Try trolling harder somewhere else. How dumb do you sound? You're bragging about a Nexus receiving the 5.0 update before a phone with a HEAVY customized UI? Lol stop while you're ahead. And from the looks of it, S5 was the #1 selling Android phone every single quarter across the globe - more than the M8, G3, Z2/Z3, and Nexus 5 combined. I would be more than happy for you to prove me wrong. Take your time, I have all day. Who cares about Lollipop on a s**tty Nexus phone? I know, my almost 4 year old S2 lags ... less than when I bought it june 2011. Try again. You said they don't get updates, but YOU JUST SAID the S5 is getting updates now. So they do get updates (maybe a little late but that's not the same as never). And no, benchmarks are not pointless. If they were so pointless, because every company uses it as a quantitative measure of improving their products over time. @Teenaxta Troll harder somewhere else Samsung has a 12 month release cycle for flagship phones. The Note and Galaxy S series are on different release cycles about 6 months apart, but the Note series is a phablet, not a "phone" so they are both a flagship in their own category. S6 will be a cracker phone. Has the best screen, the best memory, the best storage, and is as fast as fk. That's a lie. I've had my Galaxy S4 for almost 2 years now and it works perfectly. I'm running Android 4.4.2 and will be getting Lollipop just as I buy my Galaxy S6. The battery life in GS4 is still good too. After an 10 hour day of programming I come home and my phone still has 50-60% of it's battery. It doesn't lag, you are just a moron who doesn't know whot to setup your phone correctly. Every phone from every company get's replaced every year. Many companies have multiple flagship devices. So your reason for singling out and hating on Samsung is a bit idiotic. Also, point out three times when there was an advancement in performance over a previous model phone for any company? The only one that I can think of that comes anywhere close is maybe the iPhone when it went 64 bit. So I have to ask, why spend your money on anything when you know full well that the next year will see a better model? Why buy a car? Why buy a computer? Why buy a phone? Why buy a camera? Why leave your cave when the world is always constantly changing. It's a big and scary world full of phones that will one day be obsolete.